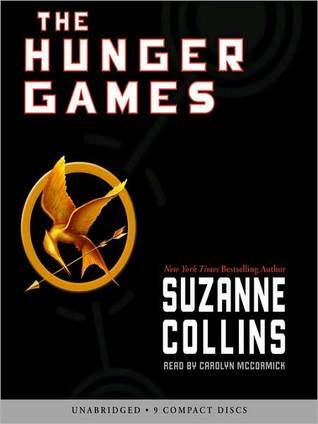 For those who follow me on Twitter (or watch my vlog) knows I was on a very long waiting list for the audiobook of Hunger Games. I didn't read the series when it came out a few years ago because I was still a bandwagon reader and none of my friends were reading it. Then when the craze hit earlier this year, I just had too many books in my pile. After watching the movie, I knew I had to read the book. However, I still didn't have space on my reading list. Audiobook was the only way I was going to get to it. And it was worth the wait. I love listening to books that are told in first person. It is easier to keep up with the story because it is limited and focused. I thought the movie followed the book pretty closely, making changes only to make the story to flow now that it was no longer told in first person. Of course there were details that the movie left out that enriched the story now that I listened to the whole book. I cried in the same spot on the audiobook as I did in the movie. The scene with Cinna and Katniss right before the Game starts. I think Cinna may be my favorite character. I hope we get more of his background. I'm on the waiting list for Catching Fire, so please NO SPOILERS. He seems to be more affected by the Game than the other members of the team. It's like he sees it as the sadistic tool of the Capital that it is. I wonder if he isn't really from the capital. Your turn: Do you like to listen to the audiobook even if you have read the book or watched the movie? Do you have a preference in narration style (first person, third person, etc.)? I checked out the audiobook for Caleb's Crossing earlier this year, after reading it last year. Mostly because Jennifer Ehle read it. And all of my rereads of the Harry Potter series and the Chronicles of Narnia have been via audiobook. Sometimes they are the easiest way to reread a title, since I can listen while doing other things. There's been a few titles where I've listened to the audiobook first, and enjoyed it so much that I've purchased the book afterwards. I don't listen to the audio book if I read the book or seen the movie. I did like The Hunger Games though (http://manoflabook.com/wp/?p=5068) but read it only because my wife did before me, LOL.